I think of winter as a time when bugs and snakes and things that cause nasty bite wounds are asleep. While this is mostly true for our friend the rattlesnake, I learned last week that it is not so for spiders, when I was called out to see Venus, a 12 yo thoroughbred mare. Venus was fine the night before when her owners closed up the barn, but they came out Sunday morning to find her standing in her stall with her head down, breathing heavily, unwilling to move, with a severely swollen hind leg. On my arrival, initial examination revealed an elevated heart rate (80 beats per minute/normal 40), respiratory rate (24 breaths per minute, normal 12), and temperature (104.5 F, normal on a digital thermometer 99-100). Venus was exquisitely painful - her breathing was shallow and panting, when forced to move she hopped on her right hind leg, and the leg was 3x normal size, from the pastern to the stifle. The swelling in her leg was warm and very painful to touch. After careful examination of the leg, I discovered a tiny red spot on the lateral aspect of her metatarsus (outside of the cannon bone). The skin immediately surrounding this spot was weeping a clear yellow fluid. The rule outs for acute, severe swelling and lameness in a limb are abscess, infection, and fracture. The most common is a foot abscess. However, it would be extremely unusual for a hoof abscess to cause swelling extending this far up the limb and such a high fever to develop in just 12 hours. Nevertheless, I pulled out my hoof testers and performed a careful examination of the hoof before crossing this one off the list. Next to eliminate was fracture of the tibia or femur. These bones in the upper limb, when broken, may be associated with severe swelling of the surrounding muscle masses. However, the presence of a high fever was not consistent with fracture, and once Venus was brought out of her stall and moved around a bit, she did bear full weight on the leg when standing. This did not completely eliminate the possibility of fracture, but made it less likely. Upon discovery of the red spot with serum oozing around it, the high fever, severe pain, sudden onset of swelling and lameness were most compatible with a diagnosis of cellulitis of unknown origin. Cellulitis literally means inflammed cells. It describes a condition where something - trauma, bacteria, virus, toxin, cancer - sets off a cellular reaction that causes the body to release fluid, white blood cells, and a wide variety of small chemical molecules into a region of the body in response to the insult. This is the body going to war - these factors are the body's soldiers and weapons that it uses to kill invading organisms. Unfortunately, as in any war, there is collateral damage, and the body not only attacks the enemy, it also attacks itself. The result is swelling, heat, pain, and redness, the four classic signs of inflammation (rubor, calor, tumor & dolor in latin - these signs have been recognized since ancient times). The yellow fluid leaking through Venus' skin was serum - as the cells in her skin and underlying interstitial tissues fell apart, the blood and lymph vessels in the area also lost their integrity, allowing the fluid that should be retained within the body's plumbing system to leak out. The damage to Venus' leg was so severe that this liquid was exuding through her skin - the body's final and most important barrier to the big bad outside world. Whatever the initiating cause of cellulitis, the destruction of the body's intricate array of barriers to the external environment allows immediate invasion of infectious organisms that always are lurking about- primarily bacteria. In a barn setting, these bacteria are everywhere because they love to live in warm organic matter - manure, bedding, wet spots under water buckets - I'm sure you can imagine many more if you look around your barn and paddocks. Although to us hairless humans winter feels very cold, in our climate prolonged deep freeze is actually rare - and if you dig to the bottom of the manure that's been accumulating since November in the corner of a pen, you'll likely find some warm, wet spots that are the bacterial equivalent of our mid-winter Baha vacation haven. So, let's take a step back and decide what to do for Venus. Although at this point we have not determined the definitive cause of her clinical signs, we have put together the fever, painful swelling, and serum leakage as indicators of cellulitis as the most likely primary problem. We have reasoned that cellulitis is associated with inflammation and infection, therefore our initial treatment should be directed against 1) pain 2) inflammation 3) infection. On a scale of 1-10, I gave Venus' condition a clinical score of 8 - very severe. When choosing medications, we must chose oral, intramuscular or intravenous routes of administration, and we must choose drugs according to their strength and spectrum of activity. Venus needed the big guns - so she was given intravenous flunixin meglumine (Banamine - anti-inflammatory/analgesic), Gentocin (antibiotic) and Potassium Pencillin (antibiotic) as well as an intramuscular tetanus toxoid. The next concern was hydration and nutrition. I decided to monitor Venus' reponse to therapy for 24-48 hours. She did improve, but it was not logistically possible to continue frequent intravenous antibiotic adminstration and Venus did not eat or drink well over the next 48 hours, so the decision was made to hospitalize her where she responded rapidly to intensive medical therapy. She returned home a healthy, sound horse, although she continued to loose hair and some skin on the affected leg for 10 days after the initial insult. What happened to Venus? The owners reported finding a Black Widow spider in the tack room next to Venus' stall a few days before her adventure began. They have had problems with these spiders in the past. Although we cannot know for certain, I believe that Venus was bitten along the side of her cannon bone (the red spot leaking serum) by a Black Widow. We have two spiders in our area that cause toxic bite reactions. The picture at the top of the blog is a Brown Recluse. 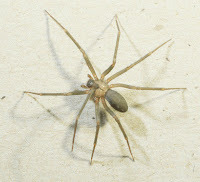 The actual Brown Recluse species is rare in Northern Nevada, but we do have a closely related species. 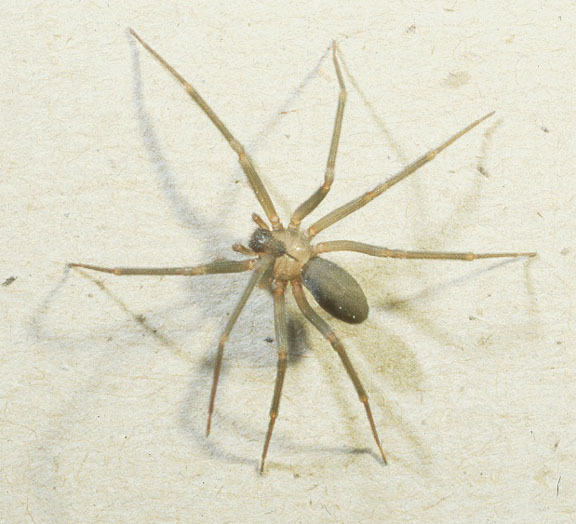 The bite of the Brown Recluse and its relatives causes a severe, localized, necrotizing reaction, but not a generalized response. The site of brown recluse bites initially is warm and painful, and over the subsequent 3-7 days may develop into a deep, debilitating open wound with massive loss of tissue and secondary infection.